It's no secret that we're not fans of the poor general quality of Autonomous standing desks, so we'll have to just say the SmartDesk First Class is the "best of the worst." First Class is a misnomer as this desk represents a mere $50 upgrade over the SmartDesk 2 Business Edition, which doesn't put it anywhere near the premium desk category. One desktop option and only four color combos is so limiting we can't understand how Autonomous expects a lot of buyers for this, their new "signature line" standing desk. Taiwanese linear actuators do give the First Class a definite edge over their other commodity-produced, Chinese standing desk frames. Dual-stage, round-tube, electric lifters with synchronized dual motors. Autonomous claims both 1.6 inches-per-second and 2.3 ips on its website, but our lab testing of TiMotion's bases indicates 1.6 ips is the correct number. Depending on which of the conflicting published specs you wish to believe, the First Class SmartDesk is rated either for 220 lbs or 330 lbs. Based on our lab testing of other TiMotion bases we'd be inclined to believe the latter, but this will be validated in lab testing of this specific model shortly. A step above the earlier SmartDesk models, none known for their quality, the First Class uses Taiwanese linear actuators and electronics in this similarly mass-produced Chinese base. 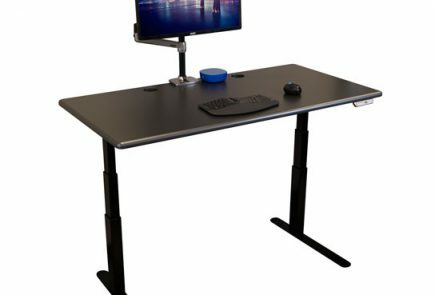 Depending on which of their conflicting published specs you want to believe, it could be faster, quieter and stronger than their other standing desk products. With TiMotion componentry it should certainly be more reliable, though this is not reflected in the warranty term, which is still the same five years on the base (zero on the desktop) as on their SmartDesk 2 Business Edition. Assembly is about 20% faster than the other SmartDesk models. While it may be worth the $50 premium over the SmartDesk 2 Business Edition, the First Class is not by any stretch of the imagination a premium standing desk. It is still a commodity product made as cheaply as possible. With only one size desktop (53" x 30" x 0.75") and only two color options for the top and two for the base, the First Class desk is absurdly narrow in decor options. Contrary to their marketing claims, the round tubes used in the lifting legs are inherently less longitudinally stable than the rectangular ones found on most desks, they're just cheaper to make. We can't generally recommend Autonomous standing desks for their reliability and quality issues but if you're looking to spend as little money as possible on a standing desk, this model is the only one we'd remotely recommend from Autonomous. It is categorically better than their other offerings, worth the extra $50. But "First Class" is a misnomer; this is not a premium standing desk by any stretch. And the limitation of only four color combos and a single oddball desktop size make it a misfit for most consumers who have a specific space to fill with a compatible decor. The Autonomous SmartDesk, first launched in a successful Kickstarter campaign as the world’s cheapest standing desk (in every sense of the word), has reached epic popularity among its target millennial audience—along with an epically awful reputation for poor quality. Ever since then the company has launched a steady stream of office fitness products, each one mass-produced in a Chinese factory to be sold at a price lower than just about any competitor in the US market. The company’s founder is boastful about his scorched-earth land grab strategy, aiming to bury all his competitors. Autonomous.ai is indeed neck-and-neck with Varidesk.com as one of the two most trafficked websites in the office fitness industry, owing to their massive advertising budgets—and in the case of Autonomous, aggressive social media strategy. We have to give credit where credit is due. Even though we’re not big fans of their products, Autonomous has done a lot to protect our younger generation from the afflictions of sitting disease—not by educating them about the dangers of a sedentary lifestyle, but just by making it cool to use a standing desk. Impressively, the company continues to succeed in moving huge volumes of its cheaply-made products to less discriminating, more budget-conscious, younger customers in the US. Though it’s pretty clear that a few online standing desk sellers have entered the dead pool or seem to be hanging by a thread (e.g. GeekDesk, Multitable) as a result of this intensified price pressure, the leading players in the industry (e.g. Fully, UpLift, StandDesk and iMovR) have been thriving and growing just fine, appealing primarily to older customers willing to pay for higher quality. To try and take a bigger bite out of their higher-end competitors, the company recently announced its Autonomous First Class standing desk. Our expert review staff set out to discover whether this new model is “first class” only relative to the cheaper desks, or a truly bespoke desk on par with premium offerings competing vendors. The “First Class” moniker implies a top-flight customer experience, but in this case we’re really talking about a Premium Economy upgrade. If you’ve flown international then you know that flying First Class is an entirely different experience than flying coach, or even business class. We’re talking elegant lounges, champagne during take-off and an eight-course tasting menu, before your bed is made and your pillow fluffed. Turning left when boarding opens up a whole new world; a world of legroom, hot towels and white tablecloths. Seats that contain a dozen electric motor adjustments and can lay flat for sleeping; a robust multimedia entertainment system to make the entire flight pass like a day at the movies. On domestic US flights, First Class will get you a wider seat with more leg room, a small finger bowl of warmed nuts before take-off, free drinks, and a dedicated flight attendant for your small lot of a dozen or two privileged passengers, but these modest differentiations are relatively meager compared to crossing the pond in First Class on British Airways or Singapore Airlines. So how well does the First Class moniker apply to the new $498 Autonomous SmartDesk model? It doesn’t, not even by domestic standards. It’s more like Premium Economy—a little extra legroom, priority boarding and some free snackage. As, quite frankly, its price would imply. As opposed to their other desks, the First Class isn’t entirely made in China. It uses linear actuators (the lifting columns) and electronics from TiMotion of Taiwan, while the rest of the frame is made in China. TiMotion has a long history of making high-end, heavy duty lifters for medical equipment, but also low-end actuators for consumer products like sofa recliners. 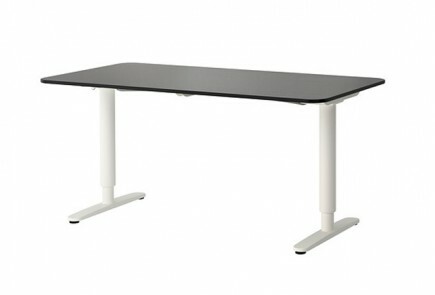 The high end stuff can be found in premium standing desk bases like the iMovR Vigor. This is not the high end stuff. The first giveaway is that the lifting columns are round. This is not just a simple stylistic difference from a base like the Vigor, or for that matter 95%+ of electric standing desks. Round tubes are cheaper to make but demonstrate equal “deflection” in both the latitudinal and longitudinal axes of the desk, as compared to rectangular tubes that provide more stability where it counts—in preventing front-to-back desk wobble (the longitudinal axis). The Autonomous marketing team apparently missed this engineering detail when they decided to claim the First Class desk’s round tubes as a stability-enhancing feature, rather than its true purpose, cost reduction. You can learn more about this and all the other factors that go into a desk’s stability in our primer on Why Some Standing Desks Shake More Than Others. 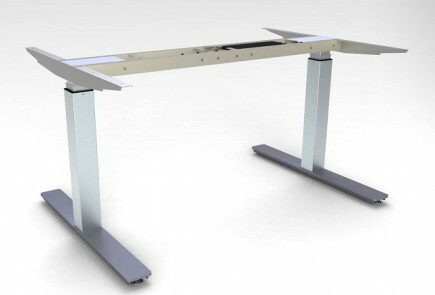 Everything from the weight and length of the feet to the precision machining of the “glides” between the legs’ tube segments goes into determining the stability of a standing desk. As for the other basic points with which we comparatively score any standing desk, the First Class is definitely an upgrade from standard autonomous fair. It is quieter and faster, and with its 330 lb lift rating, stronger than the other models. As such, Autonomous positions it as their “signature” line. The hand controller, however, is a very cheap looking plastic affair that isn’t even as nice looking as the cheap plastic affairs on their lower-end desks, so that’s a bit of a disappointment. And some early buyers have complained that there are is no cord management included with the first class, and the Autonomous cable trays are incompatible with its design. OK, that’s a little unfair. This desk comes in more color options than just black. They offer a white top as well. And the base can be ordered in grey or white. The tabletop comes in one size, an oddball 53″ x 30″ x 0.75″ dimension. That’s it. Those are your only First Class options, for a $449 flat rate price, plus $49 for shipping. We find the “signature line” distinction a bit funny when this First Class SmartDesk has even fewer options than their low-end lines. When compared to stand-up desks like the Jarvis or Energize that offer hundreds or thousands of size/color combinations, respectively, the four color combos and single size option offered in the First Class desk seems audaciously paltry. No walnut or bamboo options here. No doubt this keeps the inventory commitment and shipping costs low for Autonomous, which may be hedging against how many customers will spend the extra $50 over the cost of a SmartDesk 2 Business Edition. The diminutive tabletop also ensures that the stability weaknesses of the base are not as obvious as they would be with a six or seven-foot-wide desktop. Like Varidesk’s new ProDesk Electric 60, with it’s sole 60″ x 30″ desktop size option, Autonomous seems to be betting that customers will not care about optimizing the size of the desk for their available space. Autonomous SmartDesks are notoriously hard to put together, shifting the burden of labor from the factory worker in China to the consumer in the US. They can come with as many as forty bolts for the user to install using the teeny tiny throwaway Allen key supplied in the box. You’d be putting it together all day if you didn’t have a power screwdriver with a hex bit handy—a prerequisite in our opinion. The First Class SmartDesk is a little easier to assemble than their other models due to the fact that the crossbars are already attached to the motor housings of the lifting legs, reducing assembly time by about 20%. You’ll still need to attach the top arms, insert two bolts into each motor housing, screw the whole base down to the top, insert four machine screws into each foot, screw in the hand controller, attach all the cables, and so forth… you can get some idea of the steps in this sped-up video of the installation process. The First Class is not a pre-assembled desk like the iMovR Lander by any stretch of the imagination. But it is half the price. Like the other attributes described above, the warranty on the First Class desk doesn’t seem to have a “signature line” distinction from the company’s SmartDesk 2 Business Edition desks. It’s the same five years on the base and zero on the desktop. But that’s still better than the one year warranty on the Home Edition desks. 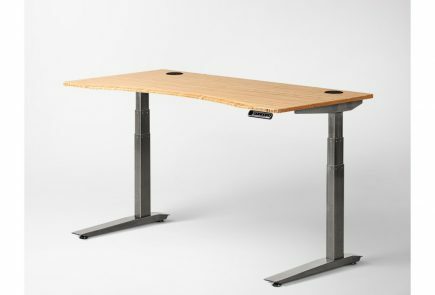 Competing desks like the Jarvis and UpLift boast seven year warranties on their Jiecang-made bases, while StandDesk and iMovR boast ten years on their bases (iMovR also uniquely also offering five year warranties on their desktops). In the spectrum of Autonomous’ product line we suppose it’s OK to name this desk “First Class,” although that isn’t really saying much when comparing to other desks in its price range. The marketing team needs to audit their own website and decide what specifications they’re going to claim for this product. In text they claim 220 lb weight lift capacity and 1.6 inches-per-second transit speed, while in drawings on the Specifications tab they claim 330 lbs and 2.3 ips. They also claim that the bases can be purchased in black, white or grey, but the shopping cart only shows the option of black or grey. White is a very unpopular color for bases in the US, while black is purchased two-thirds of the time, so this is another head scratcher for us. The good news is Autonomous offers a 30-day money back guarantee if you’re not happy with your desk, but keep in mind that these desks are really hard to take apart and rebox properly, plus the shipping cost for a consumer to return items this large and heavy can be ghastly. But don’t be fooled by the name, this is just another commodity desk from Autonomous with $50 worth of improvements over the SmartDesk 2 Business Edition, but not a premium desk product by any stretch. Be sure to check out all the desks we’ve put to the test in our Comparison Review of Electric Height-Adjustable Desks. To learn more about the differences between Chinese versus American-made standing desks see our detailed Comparison Review of Made-in-USA Standing Desks. To learn more about what goes into the stability rating of a standing desk read our in-depth description at Why Some Standing Desks Shake More Than Others. You can also check out our reviews of other Autonomous products, the SmartDesk First Class Desk, the AI-peppered SmartDesk 3 Standing Desk, and the SmartDesk Mini Standing Desk Converter.